A new poll conducted by USA Today and Suffolk University reveals 62% of Democrats hope the Party is DONE with Hillary Clinton as a presidential candidate. In other words MOST Democrats are now sick of Hillary Clinton and just want her to bow out and go away gracefully. I doubt she will however! She’s never going to be POTUS because people don’t trust her and don’t like her. And neither will her daughter! 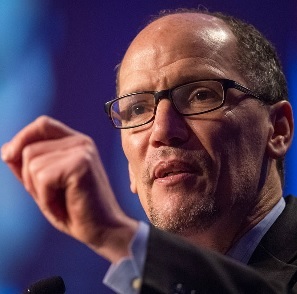 That said, you may have heard that former Obama Admin Labor Secretary Tom Perez was elected Chairman of the DNC a few days ago. Frankly, I think he’s a good pick as he tends not to be an over the top loudmouth. The guy DOES have some common sense which is something much needed in the DNC today. Yesterday he appeared on “Meet the Press” and was speaking about President Trump’s order halting immigration from seven Muslim countries with ties to terrorism. Perez thinks Trump’s order is “ill advised and frankly racist….against Muslims.” I beg to disagree with Perez! There’s nothing racist about it as it is a matter of NATIONAL SECURITY! We have to begin somewhere when it comes to stopping terrorism and this is a start. This nation would be REALLY STUPID to just let anyone and everyone into our country which essentially is what we’ve been doing for the past 8 years under Obama’s leftist yoke! I realize MOST of these people are wanting to get to the US to escape the violence and tyranny going on in such places as Syria, Somalia, and Libya but they need to be better vetted. This has nothing to do with discrimination. It has everything to do with common sense and taking precautions in an era of radical Muslim terrorism expanding everywhere. Trump’s halt to immigration from these seven countries is TEMPORARY and Obama did the same thing in the past. So what’s the big deal? I would hope Perez would see this but, apparently, he doesn’t. I’ll tell you one thing, however. The Dems had better get their act together before the mid-term elections! They’d better start making appeals to young voters and America’s working poor. And one thing they seriously need to do before the next presidential election is get someone besides Hillary Clinton as their candidate! She has a likability problem and people do not trust her. There are people who would be much better than her! The DNC needs to get to work!! My hope is that Tom Perez will be a voice of reason in the Democratic Party. A voice of common sense that will stand up for American workers and the poor. We shall see. Finally, terrorism and the threat of terrorism is something we cannot afford to be stupid or lazy about. We MUST be vigilant! We MUST take precautionary measures! We MUST do everything possible to protect ourselves! If we don’t then we most certainly will pay the price in some very big ways.